Florence will begin a “free flow” bike-sharing program on July 24, enabling riders to rent bicycles from anywhere in the city. Unlike traditional bike-sharing programs that require users to visit designated rental stations, Florence’s program will allow riders to rent bikes from anywhere, at any time. Bikes are a great way to get around the city! Through a smartphone app, users can reserve and locate the nearest available bike by GPS, use it for as long as they wish, and ride it as far across Florence as they’d like before returning it to the nearest bike rack. The app also lets riders unlock and lock the bikes, pay for usage, and report maintenance issues or misuse by other riders. When the program launches, 8,000 bikes will be available for rent throughout the city, 24 hours a day, every day. 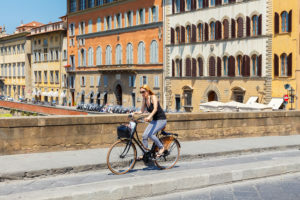 The upgraded bike-sharing system is an expansion of Florence’s previous system, which contained 975 bikes at 65 fixed locations, and will give riders more flexibility and a wider reach.